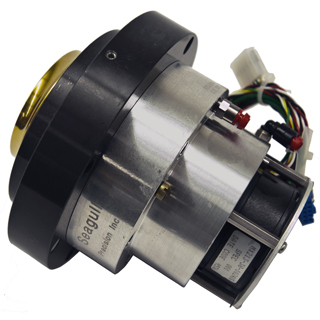 First developed for the emerging 5-1/4 form factor, this spindle was Seagull's first high volume, home grown, Air Bearing Spindle. Because of our extensive experience integrating and sevicing PI spindles it was concieved as a short journal, flat thrustplate configuration.Because payloads were quite large and radial NRR critical, excellent tilt stiffness was needed. This industry requirement resulted in unique ultra close axial clearances unique to the industry. This resulted in a bearing that was rated at only 10k rpm. Industry standard was 3600 rpm at that time. After a few hundred were in service it was decided to try to develop "Crash Proof" capability. The result was our "Stealth Crash Proof" varient which proved the concept with many thousands still in service with almost zero returns. There is a saying that "It takes an air bearing to make an air bearing". 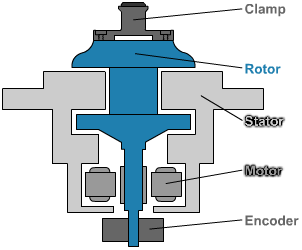 That has been proven for the Compact Air Bearing. Used as our base tooling spindle, this bearing sees daily service in the production of our various products. Capable of being submerged in coolant and taking a beating in a grind shop environment these bearings have proved their worth in an industrial setting. Stainless steel construction and the ability to house high torque motors in a moisture resistant (capable of being submerged) opens up a great number of process opportunities.